Set on the stunning white beaches of Riviera Maya, UNICO 20°87° immerses guests in the culture of the region, from the locally-inspired cocktails and cuisines to the art in the rooms. Three unique pools and holistic spa and wellness center drive home a sense of relaxed luxury, while exciting pop-up events insert a touch of spontaneity into the experience. A strong connection to the region defines the UNICO 20°87° experience. Discover and embrace contemporary Mexico face-to-face, come share in our passion for the region, defined by relaxed luxury and cultural immersion. Unique dining experiences vary from elevated fine cuisine to a casual café setting, offering up a menu inspired by local provenance. A selection of spirits can be found at each bar and restaurant, accented by a mixologist-driven cocktail program. Esencia Wellness is an immersive experience for the self featuring signature spa treatments, a full-service beauty salon & barber shop, and a state-of-the-art fitness facility. Begin a journey of well-being and enhance your UNICO 20°87° experience. A dedicated team of creative specialists helps to create surprising moments and infuse a spirit of wonder into any joyful occasion or celebration, filled with personalized details and touches directly inspired by the warmth of the surrounding region. For a truly impressive event, a team of devoted consultants are on hand to help pick the perfect venue ranging from indoor breakouts to outdoor terraces, craft a custom food and cocktail program, and design sensational entertainment. Savvy travelers always appreciate a good deal or added extra. From special rates to thoughtfully crafted packages, there’s always something new to discover. 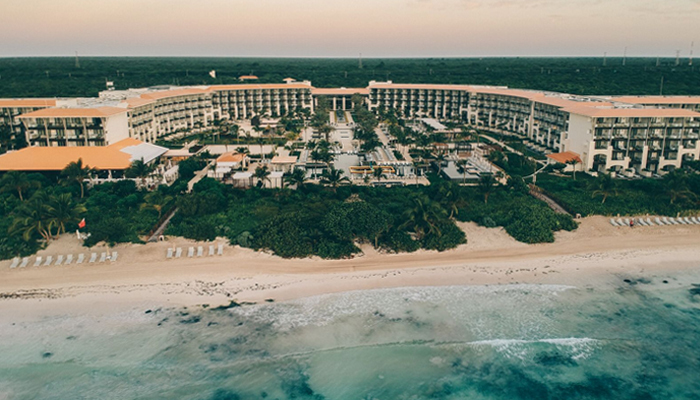 Take a look at our offers and find your perfect retreat at the Riviera Maya. Sometimes a story is better told through pictures. It’s impossible to capture the beauty of Riviera Maya through words alone—sometimes a feeling is better expressed through pictures. Discover our best spots directly from paradise. Make the most of your stay and download the UNICO 20°87° Experience App to get the scoop on our weekly pop-ups and events, order room service, book your spa, beauty salon and tours, order off the pillow menu, or learn more about our artwork.